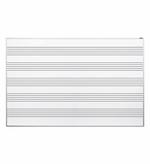 OptiMA offers dry erase music staff boards in a variety of options including wall mounted staff lined boards. 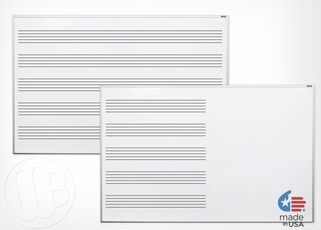 You have the option of ordering a board with music lines that cover the entire whiteboard from top to bottom or select one of our unique one piece boards that have music staff lines on only a portion of the board leaving the rest of the board blank for lesson plans, theory or whatever you wish. Those would be our combination music staff boards. We carry a tradition magnetic music staff board but we also have a very unique non-magnetic music board that we can offer at a very economical price compared to the magnetic units. If you have no desire to use any magnets or magnetic accessories on your board or your running under a very tight budget check them out. You'll be pleasantly surprised since they have the same great Opti-Print™ writing surface as our magnetic boards but at a fraction of the cost. All of our OptiMA music staff dry erase boards are made in the U.S.A. and school purchase orders are gladly accepted. From "Size" "404: 4' Tall x 4' W (+$299.95)" "406: 4' Tall x 6' W (+$399.95)" "408: 4' Tall x 8' W (+$499.95)"
From "Size" "406H: 4x6 1/2 Music 1/2 Plain (+$399.95)" "408H: 4x8 1/2 Music 1/2 Plain (+$499.95)" "" "406T1: 4x6 - 1 Staff on Top (+$399.95)" "408T1: 4x8 - 1 Staff on Top (+$499.95)" "" "406T2: 4x6 - 2 Staff on Top (+$399.95)" "408T2: 4x8 - 2 Staff on Top (+$499.95)"
From "Size" "404: 4' Tall x 4' W (+$199.95)" "406: 4' Tall x 6' W (+$249.95)" "408: 4' Tall x 8' W (+$299.95)"
Two smaller music staff boards; 18" x 24" or 24" x 36" to select from. From "Select Size" "HB-1824: 18\" Tall x 24\" W (+$69.95)" "HB-203: 24\" Tall x 36\" W (+$99.95)"